Theatre is a conduit to releasing the inner self and the psychological and sociological benefits of being part of a theatre group are plentiful. In the world of theatre, what does the box theatre bring to this equation? Let us discuss its presence in Goa through the Hauns Sangeet Natya Mandal and the Hauns Theatre Training Centre. It is not surprising that one of the most noted theatre companies of Goa saw its naissance in Ponda, also known as Antruj Mahal for being a culturally vibrant locale with its numerous temples. The establishment of the Hauns Sangeet Natya Mandal in 1950 was the culmination of the efforts of artistically and culturally kindred spirits. Of these artists, two are the now deceased Vishwanath Naik and Surya Wagh. They sought to play their part in contributing to the plentiful festivals and fairs that Ponda is famous for by staging and performing in dramas. It did not matter that most of them were illiterate or had minimal formal education; it was the hard work and passion they concentrated in this area that finally brought matters to fruition with their first production, which was titled Lavaankush. The play was a great success and since then the company has made its mark in both traditional and experimental theatre. Initially the focus was historical plays and familial plays which were predominantly musicals. Modernism ushered in change and diversity in Marathi theatre and introduced psycho-dramas, courtroom dramas, socio-political satires, etc, which went on to garner accolades at theatre festivals. Apart from the president, Mandar Jog, the other members of the Hauns Theatre Training Centre at the present time are Nitesh Naik (secretary), Vijaykumar Naik (chief coordinator), Jyoti Naik, Vijayadurga Bandodkar and Somnath Naik. While Hauns Theatre Training Centre continues with it regular training schedule, it has workshops for children and youth too. Besides the theatre workshops for youngsters, there are designing workshops that teach in practical terms how to create a set, costumes, music, lighting, etc. There are acting classes on a continuous basis titled Act I, Act II, Act III, Enact, etc. Plays of different genres and styles are produced and learning takes place in a hands on manner too. Hauns Theatre Training Centre has participated in important theatre festivals across India, including the National Mime Festival, Kolkata; the Marathi Theatre Festival by the Nehru Centre, Mumbai; the Theatre Festival by Rammat, Jodhpur; the Sangeet Natak Festival by Kala Academy, Goa; and the One Act Play Festival by Vasantrao Achrekar Sanskrutik Pratishthan, Kankavali. The centre has brought out publications to its credit such as Mann and Ahalyotdhaar. Natak…Abhinay…Rangatantra is a book on different aspects of theatre training, Hatti Ani Aamhi is a compilation of monologues by workshop participants, and Nishabd Boltana is about non-verbal plays. In the last five years, some of the major plays performed by the centre are Thodi Thodi Yuva Pidhee, Tabut Jindagi, Sanvedana.com, Majhya Mana and Aamhi Satavya Majlyaavar. Shakti and Ayudh stand out for being non-verbal plays. The concept of the box theatre was brought to Goa by VijayKumar Naik and the centre calls its box theatre Vijaykumar’s Travelling Box Theatre. It involves an unembellished space made up of a box with walls and a flat floor. It can be adapted according to the demands of the play being performed. Mandar says, ‘Here we travel with this box theatre to spread and explore the concept of a box theatre by visiting different spaces, and creating the box and making the space conducive for performance of a play. Also, it helps explore the deeper sensitivity of theatre at low cost.’ Major theatres and community halls may be financially out of the reach of smaller theatre groups. Aside from this, community halls are not always equipped for theatre performances. ‘These hurdles made us think about alternative theatre spaces which will be affordable, will be equipped with most required resources, and will give a different experience to the artists performing as well as the audience,’ says Mandar. The pros of the box theatre are that the theatre can make use of any available space because the wings that it consists of are of different sizes, both the artists and the audience share a very intimate experience, and the seating arrangement can be adjusted according to the audience and the demand of the play: one sided seating, three sided seating, arena seating or proper theatre seating. The only drawback of this type of theatre is that the setting up and dismantling is quite a difficult task which is done by the artists themselves. However it keeps them more focused on their work by taking such an active role in this aspect of the play. 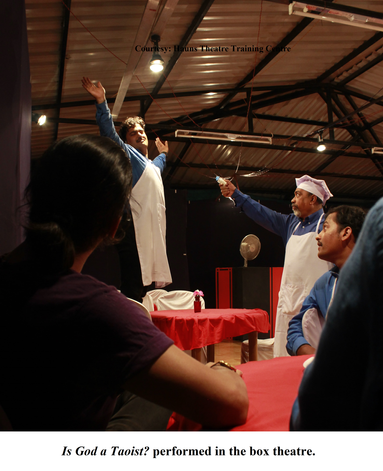 The box theatre saw its first performance in Goa in 2015. Since then there have been 7 plays with 56 performances of those different plays: Mi… Ase…. Kase, Naina, Aamhi Satvya Majalyavar, Is God a Taoist? (English), Tabut Jindagi (Hindi), Stories of Love (non-verbal).